Though not a prolific book reader, I own lots of books in the 'Adventure Motorcycling' category. I've even finished one or two of them. Actually it's exactly two of them and no, neither was Jupiter's Travels (though I did start that one). One was The Road To Gobblers Knob by Geoff Hill (Geoff's sense of humour made that one for me but ruined it for others). The second I finished yesterday having read it at my daughter's swimming lessons for pretty much the last 6 months. 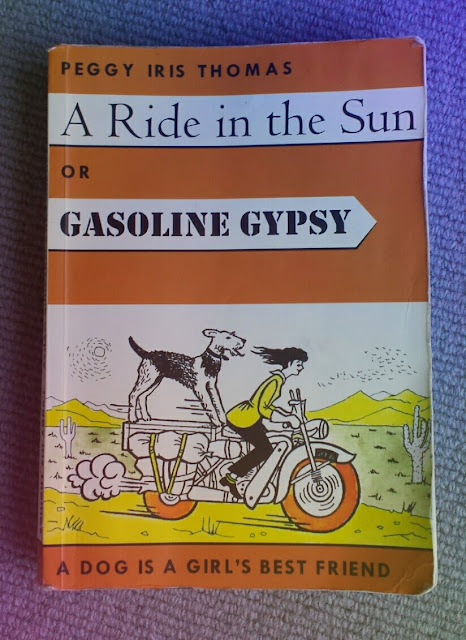 The author, an English woman with an adventurous spirit, goes on an 18 month ride around North America (with a wee dip into Mexico) in the 50s. She makes the journey on a BSA Bantam which chewed through wheel bearings and inner tubes. This was at least in part, due to it's huge load which included a sizable dog. Actually the dog was the only part off the outfit the author felt a strong connection with. He provided security way beyond that which modern bike alarms can. At first it all seems something of a stretch. RiDE magazine UK, who drew my attention to this book, got it just right. I can't quote word for word but they said something along the lines of the only person who didn't think it all seemed a bit implausible was Peggy Iris Thomas. As such, the person I most want to recommend this book to its my daughter. In fact Tom could do with reading it too. Unfortunately it would be rather lost on a six year old. A four year old who is just about able to recognise his own name certainly won't get it. Also, you need a rudimentary grasp on what was expected of young ladies in the early fifties. Having met a Bantam would also help. So who would enjoy this book? Pretty much anyone with a sense of adventure. In fact if anyone wants a well thumbed and slightly waterlogged copy, message me and be willing to send a stamped envelope. You won't regret adding it to your reading list. Have you read it? What did you think? Any suggestions on the next book I should leave in the swimming bag?